January 20, 2018, brought America the first anniversary of the inauguration of President Donald Trump. The day after his inauguration, January 21, 2017, millions of women and their male allies took to the streets to protest the things they object about Donald Trump. His campaign seemed to be filled with racism, misogyny, and vitriol. These protesters wanted the nation and the world to know that, in their eyes, America was better than the social ills that Donald Trump represented. One year later, they did it all again. The streets of America’s cities and towns were filled with protesters, many holding signs that reflected a year of trouble and turmoil for America, and for the world, and those troubles seemed to be emanating from the Oval Office. For about two years now, a consistent theme on which I have written as a teacher is that of remaining objective in front of the classroom. Students must arrive at their own decisions regarding issues such as the role of the president in government, the platforms of American political parties, and how campaigns should be conducted. Students need to be critical thinkers, discerning fact from opinion, able to evaluate complex messages and be able to apply them to the standards of American democratic ideals. 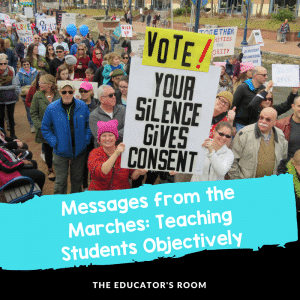 So to bring the women’s marches into the classroom is a tricky lesson plan. The signs there are overwhelmingly anti-Trump. So good government or civics teachers would need to provide some sort of disclaimer in order to become dispassionate observers of history. Think of it this way – a secondary school teacher in 1968 could have discussed the issue of the Vietnam War and America’s involvement in it, but he or she would not have been able to take a position on the political question. College professors have a greater amount of leeway and academic freedom – they can take a position. But the developing mind of the middle school or high school adolescent must be free to evaluate the facts without interference from the authority figure. 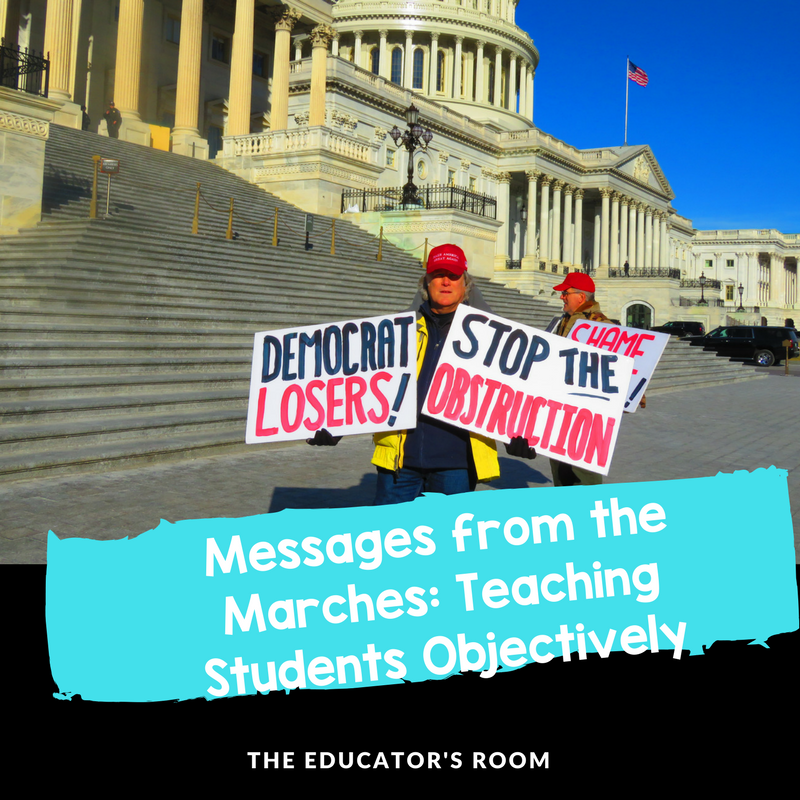 Still, the messages from the marches hold important lessons for our students, and for the teachers themselves, since both are people subject to the jurisdiction of the federal government. The signs of the women’s marches tell us something about the state of our Union: that it is fragile and under stress from a variety of forces, both foreign and domestic. If voters object to the policies of the GOP-held Congress and the Republican president, the way to bring political change is to become politically active. This heightened level of grassroots activism means participating in campaigns – from phone banking to canvassing neighborhoods, from donating money to voter registration drives. One aspect of this rising tide also has taken the form of the “Run Everywhere” campaign, where average people have run for local, state, and national government posts. Many of these candidates actually won their races, as was seen in the recent legislative races in Virginia. These new legislators are newbies to the legislative process and are wet behind the ears in getting legislation on the floor of their respective legislatures. But they are starting to make a difference in ending oppressive policies for teachers and students while calling for greater equity for women, people of color, and for the LGBTQ community, which is still the object of discrimination in America’s public schools. The female sector of the electorate is not only energized. It’s pissed off, and rightly so. Numerous male-dominated institutions had icons recently fall from grace due to sexual assault, sexual harassment, or other forms of misbehavior. Starting in Hollywood, women who experienced sexual harassment at the hands of male decision-makers have come forward and spoken out. Members of Congress have also been identified as serial abusers and have left through resignation. Academia has long suffered from abuse at the hands of male instructors, teachers, coaches, doctors, and other authority figures. These people are facing increased accountability, and the women’s marches have acted as a voice for those coming forward with something to say. The women’s marches took place in the wake of a number of revelations regarding President Donald Trump and his attitude towards people of color and women. A recent story has come to light where then citizen Trump paid an adult film star to remain quiet about their affair, which he had just after the birth of his now ten-year-old son Barron. President Trump also made disparaging remarks about certain African counties and Haiti while discussing immigration policy in the Oval Office. Moreover, the government went into shutdown mode over the issue of the “Dreamers,” undocumented children, now adults, who were protected under the DACA program (Deferred Action for Childhood Arrivals). All of these issues were seen in the signs of the protesters, and these issues need to be brought up in the secondary classroom to reinforce the message that America is a nation of immigrants and that it strength comes from the diversity of the people of every color and creed that settled here over the centuries of our existence as a nation. The women’s marches represent the energized base of the Democratic Party, and the reason why the marches are politically significant is that Democrats must maintain their energy until November 2018 if they want to achieve their goal of retaking control of both houses of Congress. The map favors the GOP in two important ways: many more Democratic senators are up for re-election in 2018 than are Republicans. And many states have their congressional district maps drawn in such a way that gives the GOP the advantage, a condition called “gerrymandering.” One state, Maryland, is gerrymandered in favor of Democrats. Students need to understand how our political process works and that it isn’t perfect. In fact, American democracy, according to the anti-Trump crowd, is under attack. The erosion of our political institutions through propaganda, fake news, Russian interference, and the abrogation of the Constitution by current officeholders, as well as by the hyper-partisanship where legislators consistently place party over country, are all tearing at the fabric that once was a strong democratic republic. For some Americans, a “Blue Wave” of Democratic lawmakers taking back control of the House and Senate is the only mechanism that can correct the balance of power in federal government, shift the growing income inequality in the nation back towards the middle class, and remove a corrupt administration that gained power by colluding with a foreign power, and then gave White House offices to its friends, family, and racist elements. The Blue Wave is the way to protect the safeguards built into our constitution, according to those holding signs during the women’s marches. These issues are some of the messages of the women’s marches of 2018. Teachers at all levels bring these issues into the classroom at their own peril. They must be able to ask the questions objectively and allow the students to debate them in an open forum that constitutes a safe space. Teachers must divorce themselves from the decision of their students. They must dedicate themselves to the democratic institutions that make up the secondary social studies curriculum in most states. They must be unrelenting in teaching the importance of tolerance, acceptance, pluralism, and the benefits of a multicultural society. The signs can help teach these timeless lessons, but teachers can’t be the ones holding them. It’s up to their students to decide which signs they wish to carry.